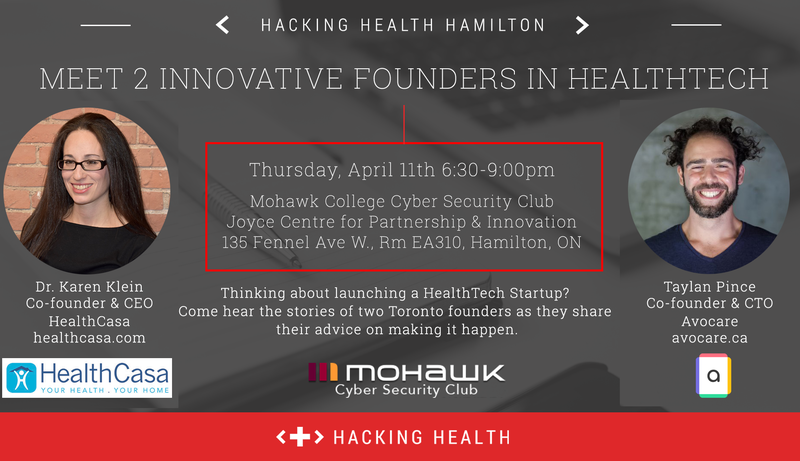 On Thursday, April 11, Hacking Health Hamilton presents How to Launch a Successful Health Tech Startup: Get advice from two health tech entrepreneurs from Toronto, an informative and interactive free meetup in Mohawk College Cyber Security Club. Avocare lets patients send and receive secure messages with their own clinic and doctor, bringing the convenience of instant messaging to healthcare providers. HealthCasa is the only on-demand service that allows you to book an appointment online through a LIVE, REAL-TIME appointment booking portal, with a practitioner of your choice, at the location of your choice, and on a day and time that is convenient for YOU! The Mohawk College Cyber Security Club was created for all Mohawk students to learn more about how to keep information and technology safe in our digital and physical lives. We invite anyone interested to join us in exploring everything technical and non-technical about cybersecurity – from how to hack websites and servers, to how to spot a phishing e-mail, the club has something for everyone. The Mohawk College Cyber Security Lab, housed in the new net-zero footprint Joyce Centre for Partnership & Innovation, is home to teams of students planning and launching, thwarting and defending real-time cyber-attack simulations.